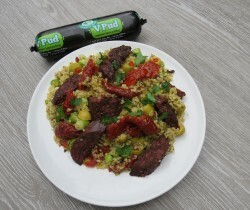 This Recipe was designed using our Vegan Black Pudding by Our Lizzy Vegetarian Cookery School. It only takes 15 minutes. Rehydrate the bulgur wheat by placing in a bowl and covering with boiling water. Cover with a plate and leave to stand for about ten minutes. Fluff up with a fork. Add the spring onions, garlic, sun dried tomatoes, and olives to the bulgur wheat. Mix in some chopped fresh herbs. Add a drizzle of extra virgin olive oil and season well. Heat some olive oil in a small frying pan. When the oil is hot, add some chopped V Pud and cook on both sides.